Dr. Kalia was born and raised in California. His father, Ram L. Kalia, a physician in India, immigrated to the United States in 1957. Unable to practice medicine because of restrictions on foreign medical graduates at the time, Dr. Kalia's father became a civil engineer. However, his passion for medicine was instilled in his children; both Dr. Kalia and his sister became physicians. The overall allure of neurosurgery led Dr. Kalia into residency at the University of Pittsburgh under the Chairman, Dr. Peter J. Jannetta. Considered by many to be one of the premier neurosurgical programs in the nation, Dr. Kalia was trained by Dr. Jannetta and his faculty including Drs. L. Dade Lunsford, Hae Dong Jho, Peter Sheptak, Paul Nelson, Laligam Sekhar, A. Leland Albright, Dachling Pang, Donald Wright, Chandra Sen, Howard Yonas, John Moossy, Anthony Kaufmann, and many chief residents and residents who have gone on to achieve great accomplishments in the field. 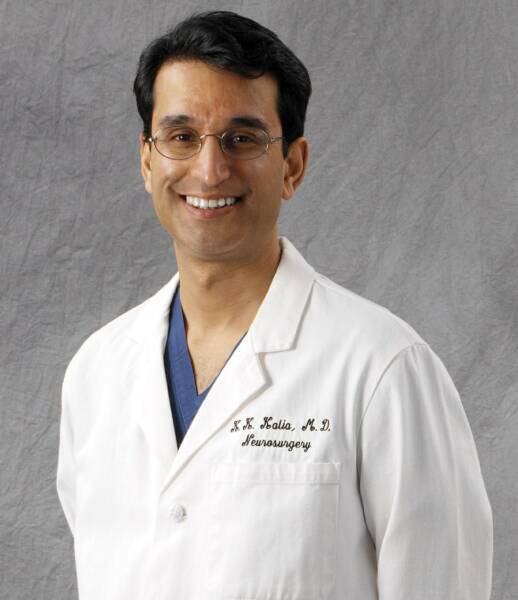 In 1997, Dr. Kalia joined Dr. Munir Abbasy in Springfield, MA. One year later, his co-chief resident from Pittsburgh, Dr. Christopher Comey, joined the practice. In 2002, Drs. Kalia and Comey formed NENA, New England Neurosurgical Associates. Dr. Kalia served as acting chief of Neurosurgery at Baystate Medical Center after Dr. Abbasy's death before establishing his current practice at Mercy Medical Center.